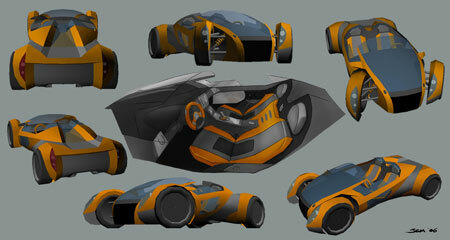 I will be posting all 30 entries to the 2006/2007 Peugeot Design Contest for your viewing pleasure. 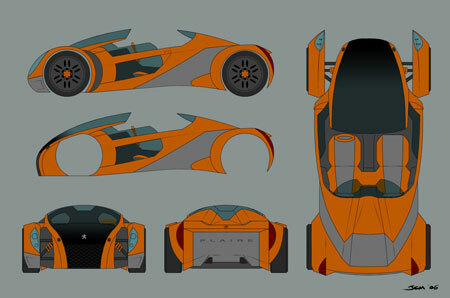 The 2007 Peugeot Design Contest theme for this year is P.L.E.A.S.E. Innovate. P for Pleasurable to Drive, L for Lively, E for Efficient, A for Accessible, S for Simple, and E for Ecological. 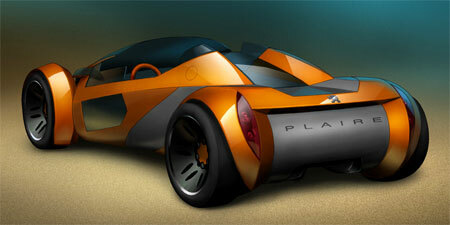 This is the Peugeot PLAIRE, by 35 year old James Ma from the USA. More photos and details after the jump. Inspired by open wheel hot rods of the 50’s combined with the sporty roadsters of today, this hybrid vehicle is designed to capture the spirit of driving pleasure with the efficiency of a modern compact. Taking advantage of recycled plastics for all the paneling over the aluminum and carbon fiber frame underneath. Interior fabrics are made from synthetics and recycled plastics as well. The front fenders are attached to the wheel axels and pivot with the steering, allowing the headlights to illuminate the heading of the vehicle. The lower panel of the doors are windows that give driver and passenger an added sensation of closeness to the road. The open cockpit design provides the sensation of a convertible while the cantilevered moon roof gives protection against light elements. Overall the combination of design and materials along with the fuel efficiency of hybrid technology makes the Plaire a great weekend car as well as a weekday commuter.